As the Darkness grows in the land its influence spreads into more than just the weaker-willed creatures. Agents were once people, perhaps even Heroes, until the Darkness invaded their minds and slowly corrupted them. With this corruption came great power at the cost of freedom. Agents are a deadly boss-type monster that the heroes can encounter in their adventures at their own peril. If an Agent is defeated, one of the Heroes is granted that Agent's ability card, bestowing them with a unique power. 3 Agent miniatures, 3 Monster cards, 3 Agent Ability Cards. 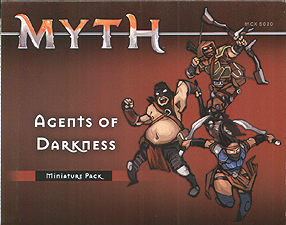 This product requires a copy of Myth. No assembly required.